I actually had this done in time to post on Friday, but I was too busy running around or being tired from running around to write all this out. 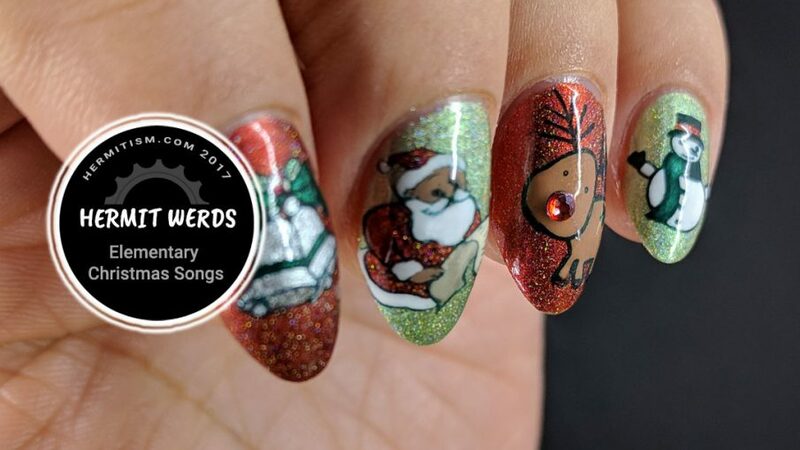 The prompt from 26 Great Nail Art Ideas was Christmas Childhood Memories. I wasn’t raised religious so that took out all the religious imagery like angels (although we had one on our tree, heh). I’d already done a manicure with presents that I’ll be posting tomorrow. So that left…I wasn’t sure. Until my step-kids started spontaneously singing Christmas songs and they were the same ones I’d learned as a kid. 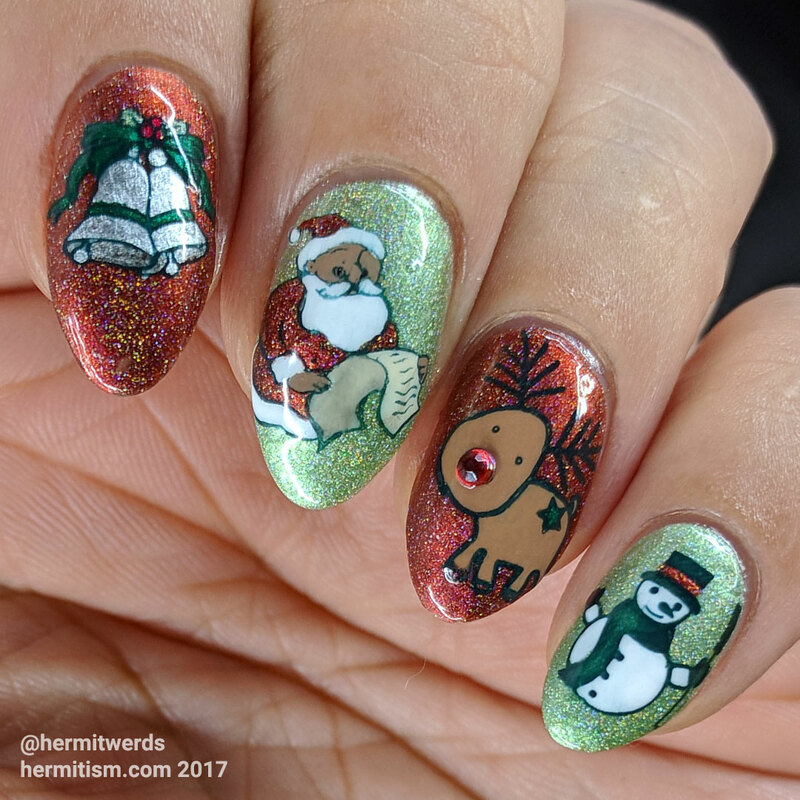 So for this manicure we have “Rudolph the Red Nose Reindeer”, “Santa’s Coming to Town”, “Frosty the Snowman”, and “Silver Bells” (because I do not have a single jingle bell image in all my stamping plates). Definitely Christmas-feeling. 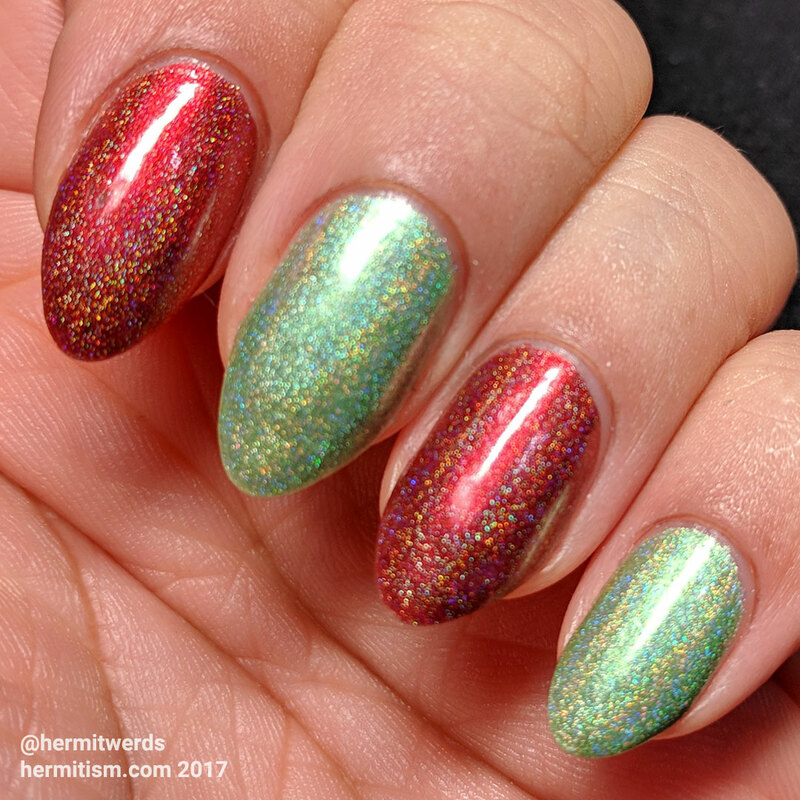 Now before we duck out to get back to being tired (curse my allergies), let’s take a look at Shinespark Polish’s beautiful holographic polishes. I love how they are just a little bit de-saturated. It gave the nail art a kind of old-fashioned Christmas feel. Especially the red. I own way too many holographic reds and “Ruby” is different from all of them.